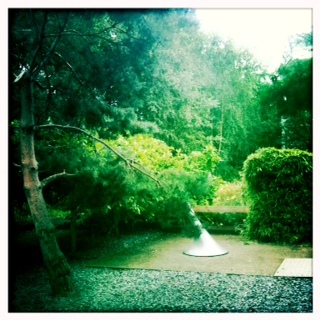 The rain has stopped, the sun is shining and so we’re off to Southside to the Hidden Gardens. Tucked away behind the Tramway through the glass doors is a world of green grass and serenity. It’s hard believe this gem of green tranquillity exists in the city. Here, surrounded by lush foliage, my shoulders relax, my mind clears and the open space embraces me. It’s certainly come a long way from its early days as Copelawhill Tram Works – now beautifully transformed from a 5000 square metre derelict brownfield site into a peaceful haven. There’s a lot to explore – follow footpaths, bridges or like my son dart in and out of hidden areas to discover the many wee sculptures or give one of the instruments a go. We even discovered a talking hedge – kind of. So, it actually turns out to be a few rascals concealed in the middle of some bamboo rather than the gateway to Narnia. Even still, it’s a truly enchanting escape from the hub-bub of the city. But this wonderful space is more than a moment of tranquillity. There’s loads of activities to try out from the Cultural Kitchen to various family activities. If you’re feeling under the weather, there’s a Medical and Cultural Courtyard to revive and rejuvenate in. Maybe you’ll even find that gateway to Narnia and have a chat with a talkative hedge.